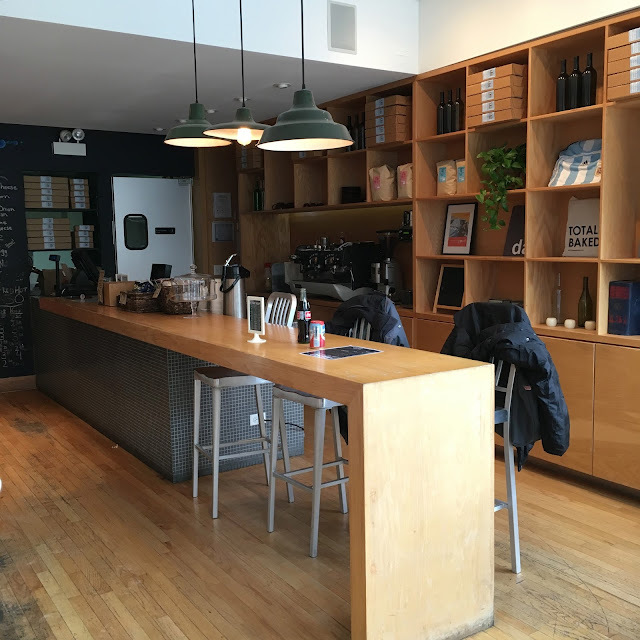 It's been a while since I added a new post to the Lakeview Neighborhood Guide series, but I'm back today with one that was well worth the wait. 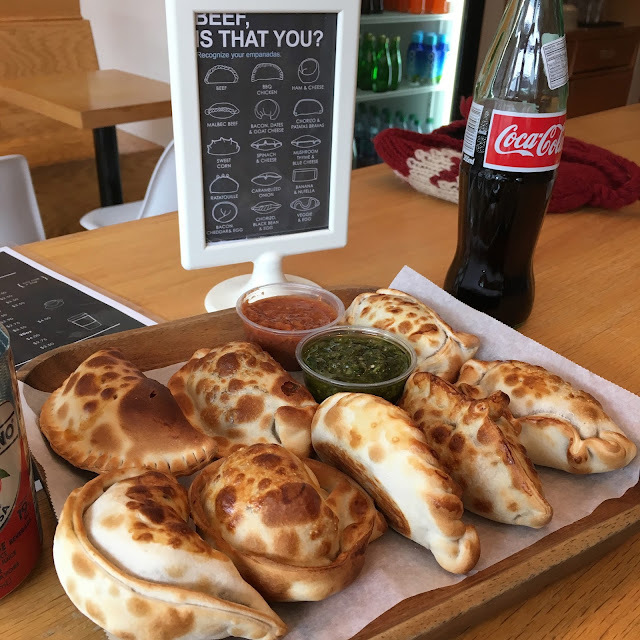 5411 Empanadas is a true neighborhood gem and one that I'm ashamed took me so long to try... Because now that I have, it's become one of my favorite places for a quick weekend lunch. 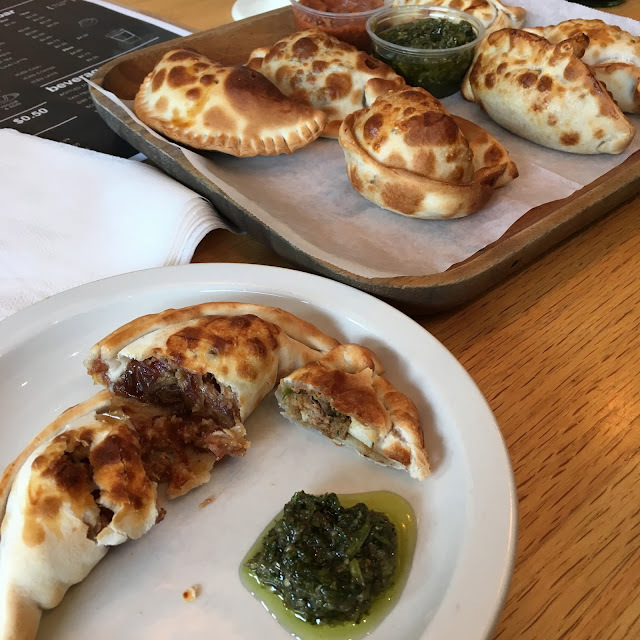 5411 is the international dialing code for Buenos Aires, a city whose food-- and particularly its empanadas-- were the inspiration behind this restaurant's cuisine. 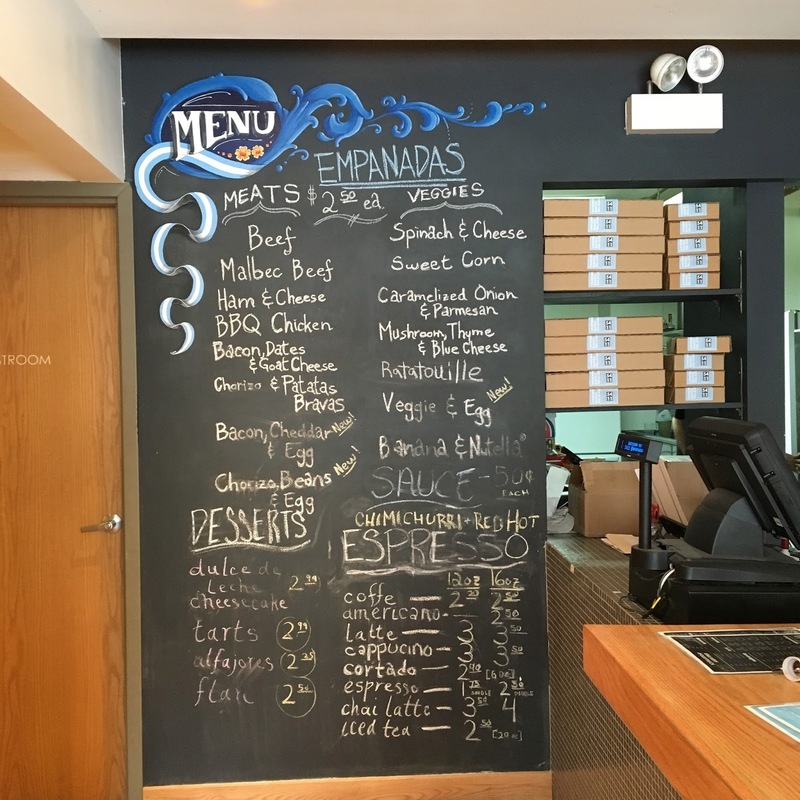 5411's Lakeview restaurant is their first brick and mortar restaurant, but their empanada empire has quickly expanded to encompass a food truck that sells out before the end of the lunch hour (where it all began), 2 stores in Wicker Park, a downtown Loop location, and even one in Coral Gables, Florida. Alex and I stopped into 5411 Empanadas on Clark St. on a recent Sunday afternoon for a quick lunch date while we were out running errands. The shop is cozy, but modern with a huge old fashioned espresso machine for a variety of handcrafted coffee beverages and a huge chalkboard showcasing their menu of empanadas. 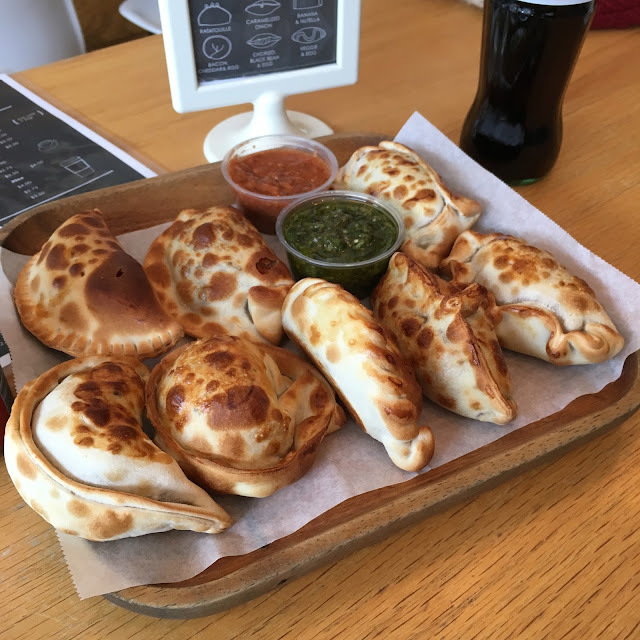 Empanadas are South America's answer to the Polish pierogi, the Italian ravioli, and the Chinese dumpling. They're made of tender pastry dough stuffed with a variety of fillings and at 5411, they're baked and not fried. At 5411 they're available with a huge variety of fillings from the traditional to the creative and from meaty to vegetarian. With so many available, Alex and I decided to order 8 different empanadas so that we could sample as many varieties as possible. At 5411 Empanadas, each empanada is shaped differently depending on its filling. Not only do they look extra pretty this way, but it's a quick and easy way to identify what you're eating before biting into it. Each table at the restaurant comes with a sheet cheat-- and there's one on every takeout box too! 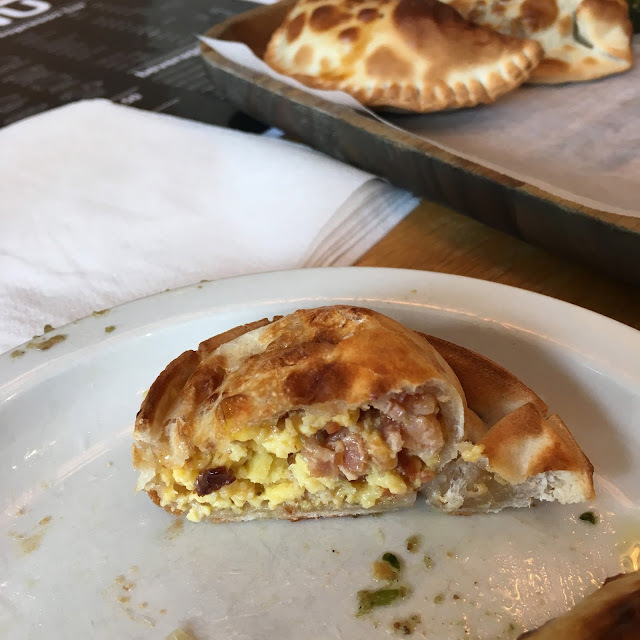 The Cheddar Bacon & Egg variety was a really fun twist on a classic empanada. These were great as a part of our lunch experience, but would be so perfect for breakfast on the go! They were stuffed with fluffy scrambled eggs, chopped smoky bacon, and melty cheddar cheese. And they were perfect dipped in 5411's spicy 'red hot' sauce. My hands down favorite is the Sweet Corn empanada. The filling is super creamy and a little sweet and a little savory, stuffed with big chunks of corn. It's also vegetarian-friendly! 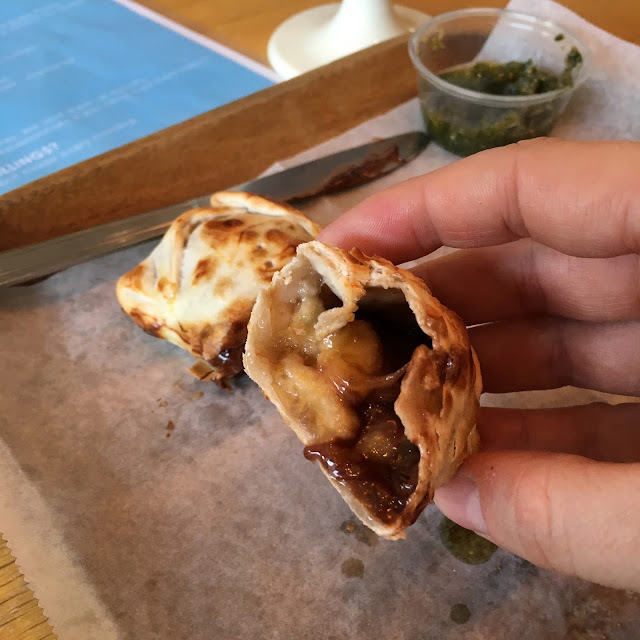 We also loved the sweet dessert-inspired Banana & Nutella filled empanada too. Alex loves anything Nutella-flavored and the fact that it was warm and melty and accompanied by ripe chunks of banana made it extra delicious. It's also a perfect little something sweet to cap off a very savory meal. 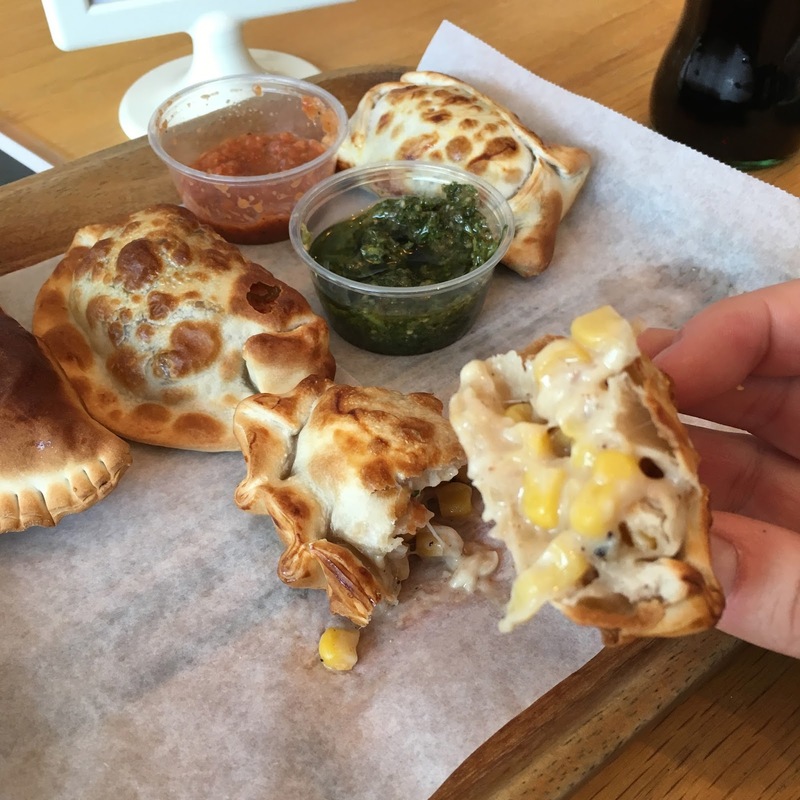 5411 Empanadas is a great option for a quick and flavorful meal when you're out and about in Lakeview. They're also BYOB if you'd like to make it a casual date night! 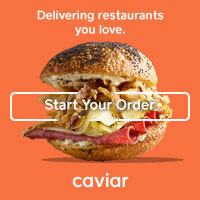 And for a date night in, 5411 also offers takeout and delivery options too. And speaking of, it's been about 2 weeks since my last empanada fix... thinking it's time to stop back in again! Editor's Note: Our meal at 5411 Empanadas was complimentary, however all opinions expressed herein are my own. mmmmm pinning this so i remember to visit!! Ive been seeing these empanadas popping up all over Instagram and now that I know there's a Loop location, I'll have to finally try them out with my co-workers for lunch! Great review! I know! I keep forgetting about the Loop location, but definitely need to add it to my weekday lunch rotation!